The 16th century can be truly referred to as Renaissance as the style had firmly taken hold throughout Europe by the early 1500s. In Italy, we speak of the High and Late Renaissance, while France, Germany, England and the Lowlands pass through the early, high and late stages during that period. Realism, individualism and perspective have spread throughout the continent. More painters of note appear in the Northern regions: Dürer, Cranach, Holbein, Grien, Brueghel, Aertsen and many more. Italy boasts Caravaggio, Tiziano and Bronzino. Spain, having become rich and powerful through the Conquistà, enters the picture with Coello and de la Cruz. Towards the end of the century, Spanish court fashion becomes the court fashion throughout continental Europe. The tendency towards realism becomes more pronounced - in some paintings, one can almost count the threads in the fabric. The Flemish and Dutch painters develop a unique tradition of depicting real-life scenes, rich commoners have their portraits painted. 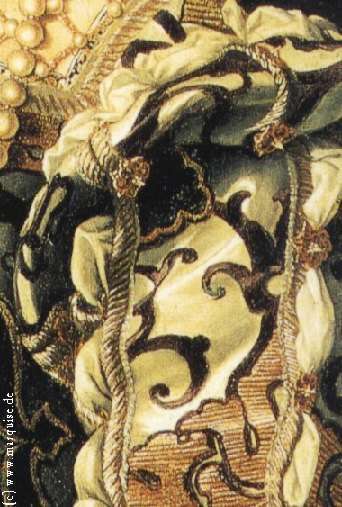 On the other hand, the Maniera style becomes eminent in Italy: Technique and composition take precedence over realism, resulting in exaggerated or artificial fabric folds and distorted and elongated limbs. However, as Maniera also emphasises the mastery of painting technique, we see an increased love of detail and 3D effects that makes it easier to study costume and jewellery up close and make deductions about the material and weight of fabrics. The 16th century is also a time of discoveries and conquests: The Americas, the Orient, India, Asia, Africa all entered the consciousness of learned minds. Costume books appear that purport to depict the costumes of all the known world, but as hardly an artist has ever travelled all these places, there is a lot of fantasy, even sensationalism involved. Another new trait of the era is an increasing interest - on the part of the artists - for the life of the working classes. Italian, Flemish/Dutch and German artists depict market scenes, maids, peasants, and everyday village life.